Home Amazon Nerf Modulus StockShot Blaster – Price DROP (Again)! Nerf Modulus StockShot Blaster – Price DROP (Again)! Do the kids have need a new Nerf Blaster? Hurry and get the Nerf Modulus StockShot Blaster today for only $7.30 from Amazon! Save 51% off the regular price of $14.99. Limit 3. Get FREE shipping (2-day for Amazon Prime members) when you purchase $25 or more of eligible items across any product category. Check out the Nerf Modulus StockShot Blaster details below. 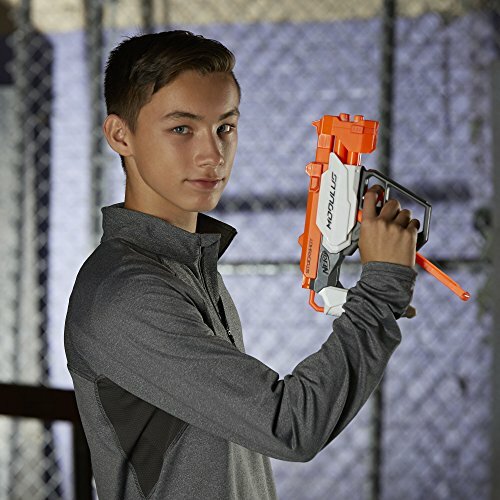 The Nerf Modulus StockShot blaster converts from a blaster to a stock attachment. Use it on its own to blast into battle, or attach it to a Nerf Modulus blaster (sold separately) as an adjustable stock for extra stability. It converts easily so battlers can customize and adapt quickly as the battle or mission changes. Nerf and all related properties are trademarks of Hasbro. Buy the Nerf Modulus StockShot from Amazon.